Saints have three players in the 34-strong England Knights Performance Squad announced today (Tuesday). 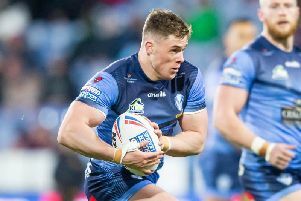 They are 22-year-old scrum half Danny Richardson - a member of last year's Super League Dream Team and the leading goals and points scorer in the competition - prop Matty Lees (21) and 23-year-old back rower Jack Ashworth, who is included in the squad for the first time. The Knights will join the 30-man England Performance Squad at their first get-together of the season next month, and will hold a number of other meetings and training sessions in the remainder of the year - with at least one home fixture being planned for this autumn, when the senior Great Britain squad are on tour in New Zealand and Papua New Guinea. Head coach Paul Anderson said: "We think this is an exciting group of players, all of whom know from their selection that they are very much in the thoughts of the England coaches. "Involvement in the Knights' set-up gives them the chance to impress, as has been shown by the England debuts made by so many players from the KPS last year, and the inclusion in this year's England Performance Squad of Robbie Mulhern and our 2018 captain Jack Hughes.